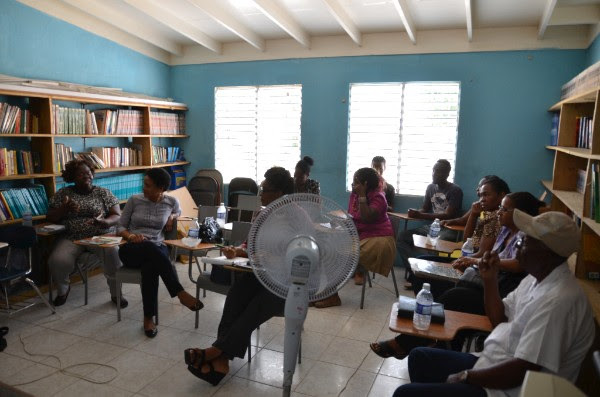 Towards 2015’s end, Jalawelo was invited to De La Vega in Spanish Town to meet with volunteers from the De La Vega City Homework Center. The volunteer leaders came out in full force to make a case for the children and youth. We saw that they were people who were committed to improving their own lives and their communities. We discussed with them how we could support their outstanding work in the after-school program. We admired how well the volunteers were able to brainstorm and devise creative ways to engage youth who need to learn to read and write. However, their material needs are tremendous. Things such as after school snacks are sometimes hard to provide. But they manage to do so, despite their financial obstacles. Aware of the material comforts they’re used to doing without, we worked with the volunteer team to provide a very special Christmas treat for the children! We thank you for helping us to sponsor such a treat which all the children were able to enjoy in the midst of their difficult circumstances.